On our travels we have come across many surprising twists and turns in history that have been long forgotten. A late afternoon visit to Goddards House at the edge of York Racecourse, home of the Terry family, revealed another of these: if the original plans of the Terry’s chocolate company had worked out we might all now associate the name of Terry’s with the chocolate apple (1924-1954) instead of the chocolate orange (1926-present). 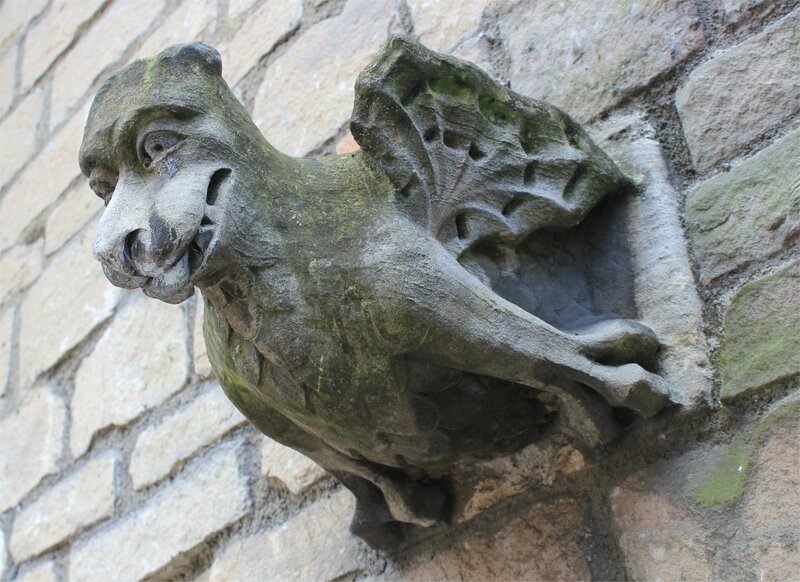 This year sees the 250th anniversary of the Terry’s business, which started life in 1767 as a chemist shop near Bootham’s Bar in the centre of York. 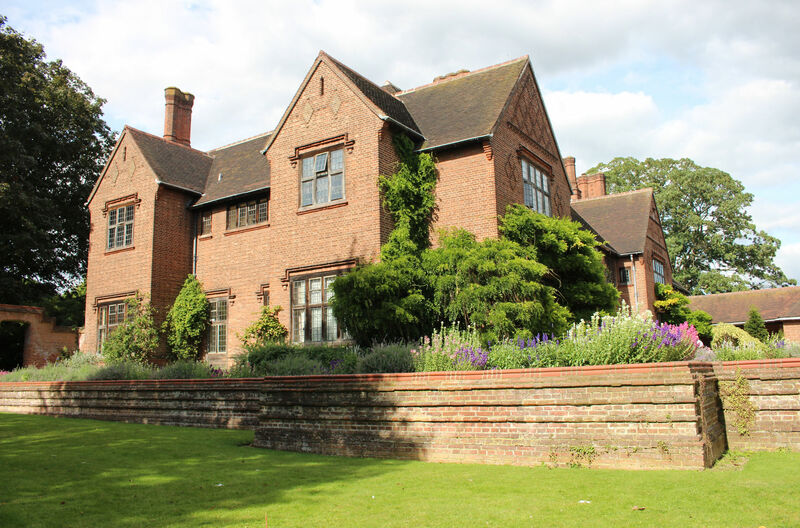 The story of the family and their chocolate business is told in the wonderful arts and crafts home that Noel Terry commissioned to overlook their new factory in 1927. 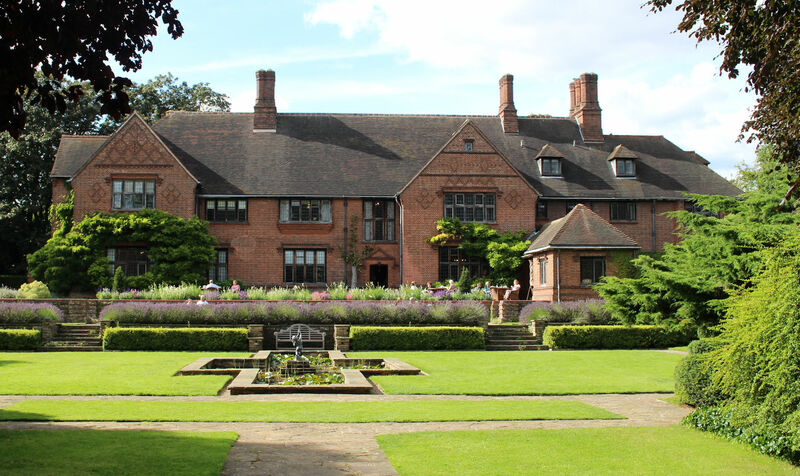 Goddards House is a lovely property in its own right but must have been all the more special in its time as a family home as Noel Terry was an avid collector of mid-18th century English furniture. Today this collection can be seen at Fairfax House and the house is rather more sparsely furnished with pieces befitting of a house of this era. 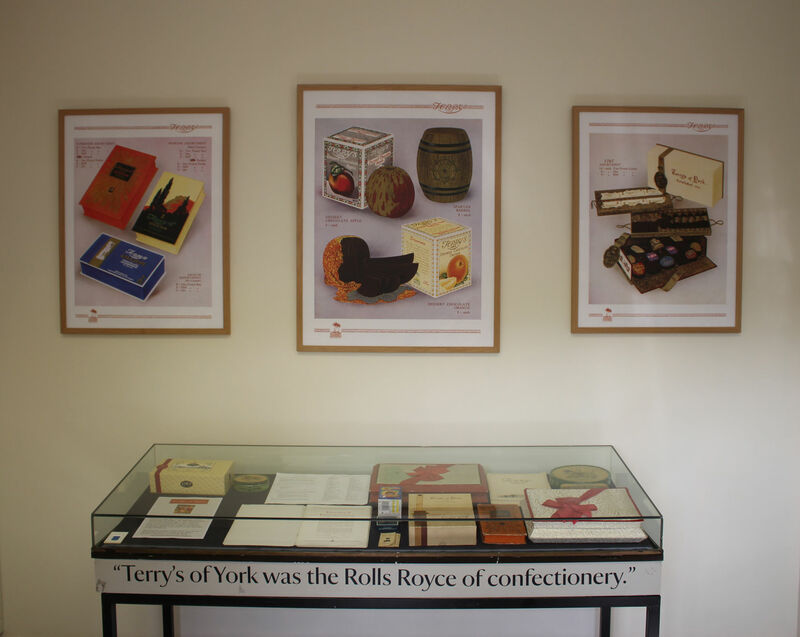 In the upstairs rooms the story of the Terry’s chocolate business is illustrated with wonderful photographs, a model of the factory complex and examples of their packaging. It offers a fascinating glimpse into the ingenious designs from the early 20th century and a bit of nostalgia for later product ranges that I had long forgotten about. The guides explained that the creativeness of the business in developing innovative products led to it having too many product lines, many with runs too small to be economic. The business was sold on to United Biscuits in 1975 and then on to Kraft in 1993 with the new owners immediately slashing the product range from over a hundred to just three. The factory closed in 2005 and production was switched to plants in Europe, such as the massive ‘line of the future’ at Skarbimierz, Poland. 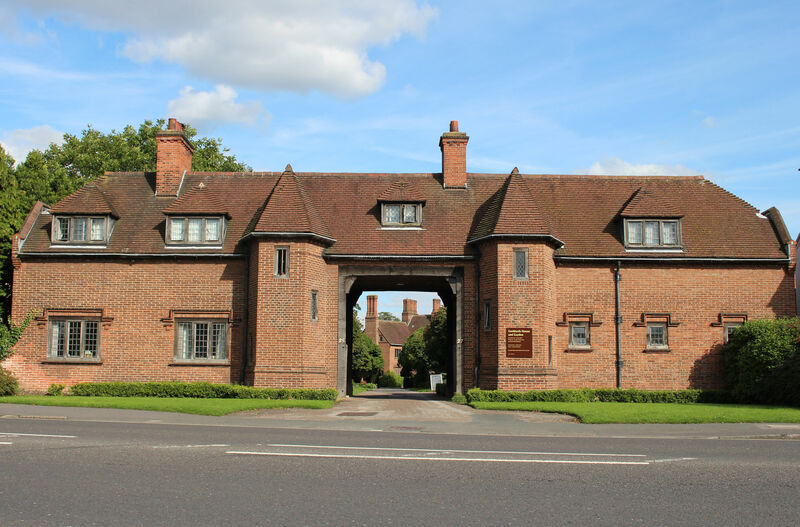 The factory site has since been redeveloped for luxury flats and the original office complex has been sympathetically restored as the hub of a rather impressive care village (including a Terry’s chocolate shop). 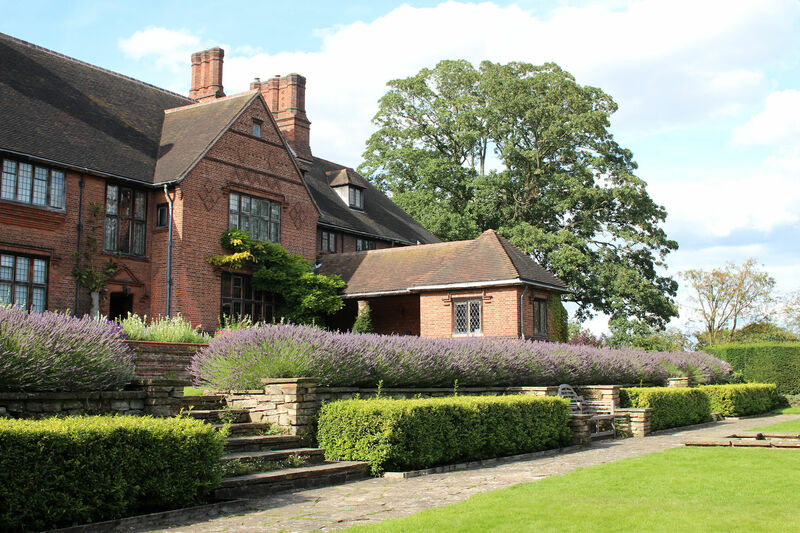 It’s well worth making the trip out to Goddards House (just a short trip by bus from York Railway Station) in this double anniversary year. 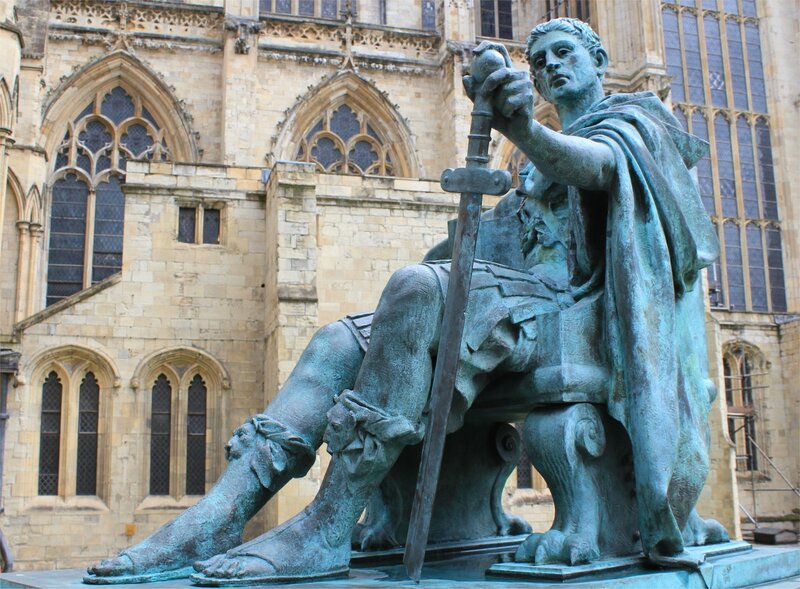 Adult admission currently costs £7 per person though for us this was covered by our National Trust membership. 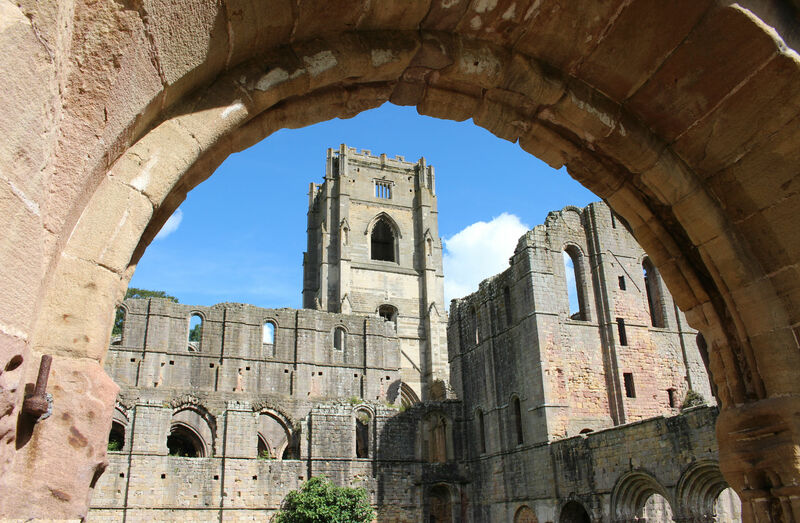 A Sunday outing to the National Trust site at Fountains Abbey proved to be a great way to enjoy a sunnier day in Yorkshire, but the initial draw for us was not the abbey ruins but the somewhat overlooked Elizabethan prodigy house. 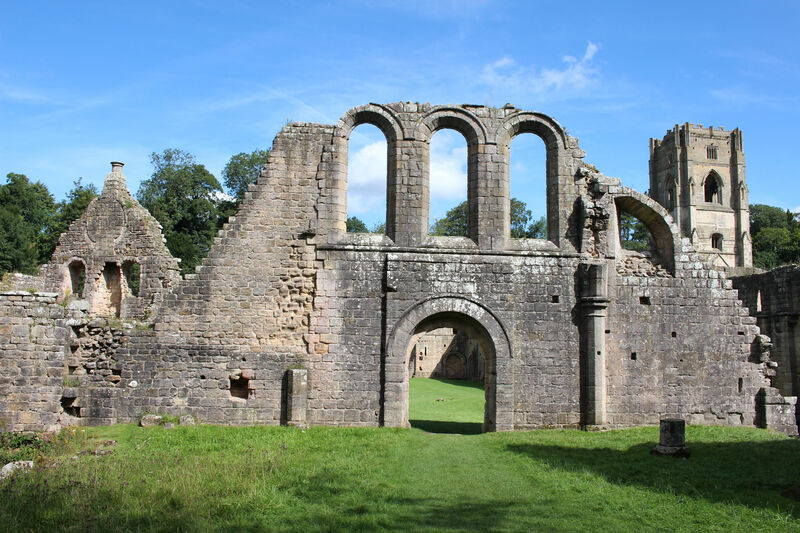 Arguably, you could say that we were still coming to see the abbey as Fountains Hall was built using stone from the ruins (the hall even includes a complete spiral staircase taken from the abbey). 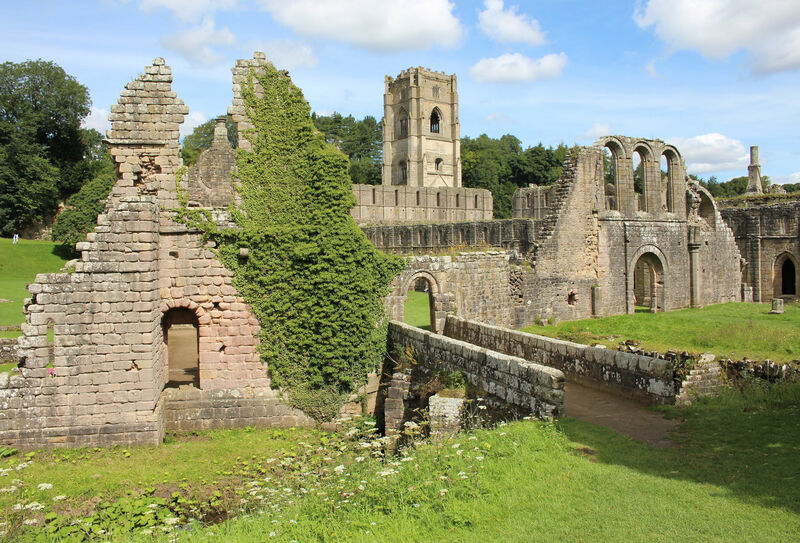 In any other location Fountains Hall would be a major attraction, but on this site it is dwarfed by the majestic ruins of Fountains Abbey and the extensive 18th century pleasure gardens of Studley Royal. 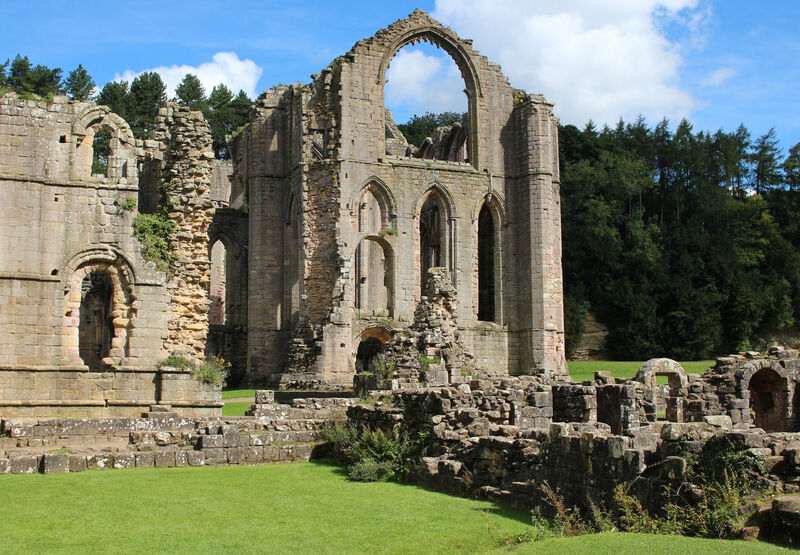 Construction of the hall began in 1598, almost 60 years on from the dissolution of the abbey and the subsequent wrecking to make it unfit for religious use. 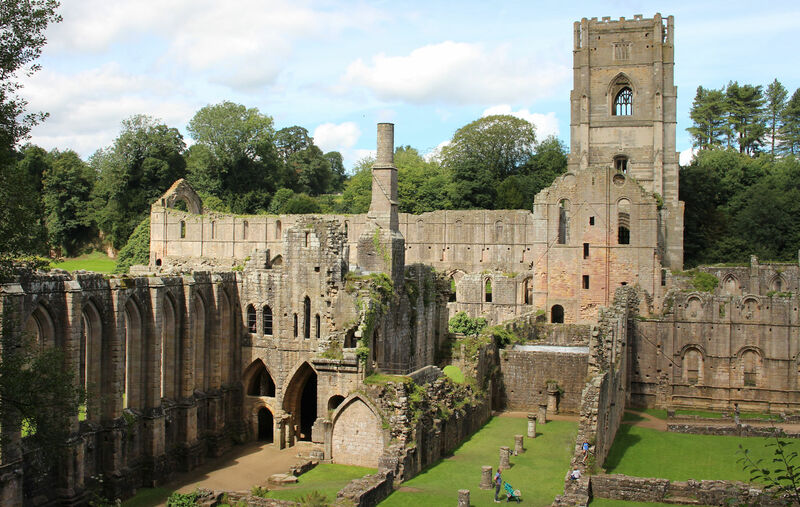 The abbey has been a ruin for the entire lifespan of the hall. 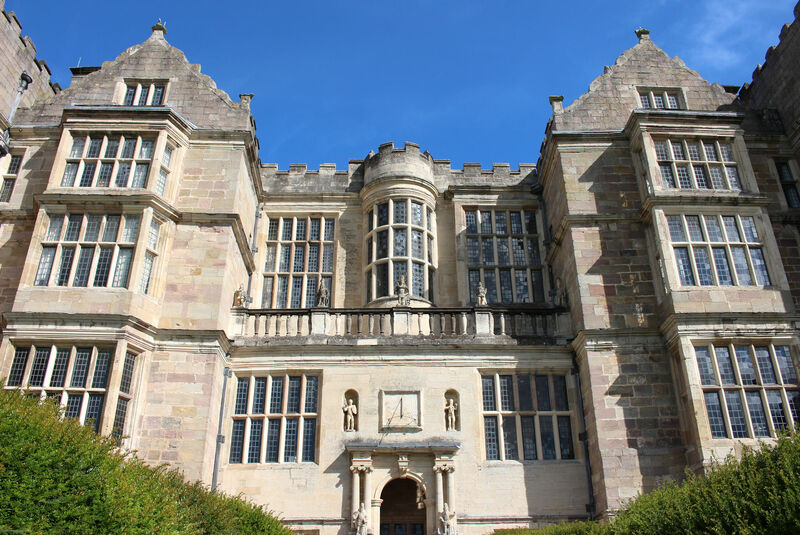 The exterior of the hall reflects the influence of Robert Smythson but is not in the league of grander houses from the late Elizabethan/early Jacobean age such as Hardwick Hall or Burghley House. 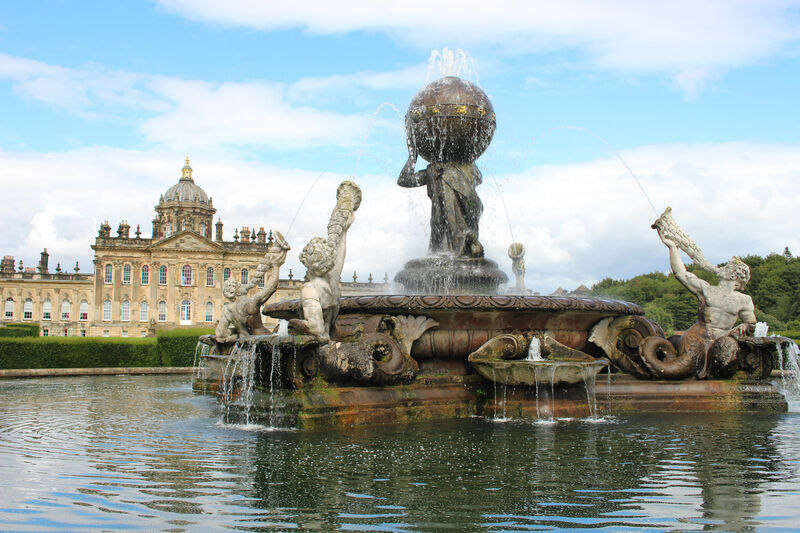 Nevertheless, Fountains Hall has the wow factor that you expect from a prodigy house even if the three rooms open to visitors can’t hope to live up to that first impression. Through much of its history the hall has been in a state of decay as the home of estate workers and tenant farmers. The rooms not open to visitors include holiday and staff flats. The later history of the hall turns out to be as fascinating as its beginning. 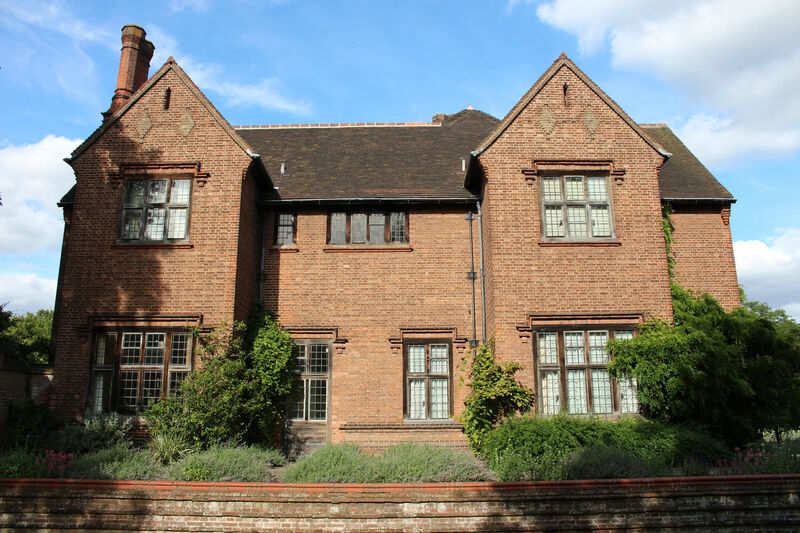 In 1923 the hall was purchased by the Vyner family and their extensive restoration efforts saved the building at a pivotal moment in its history. 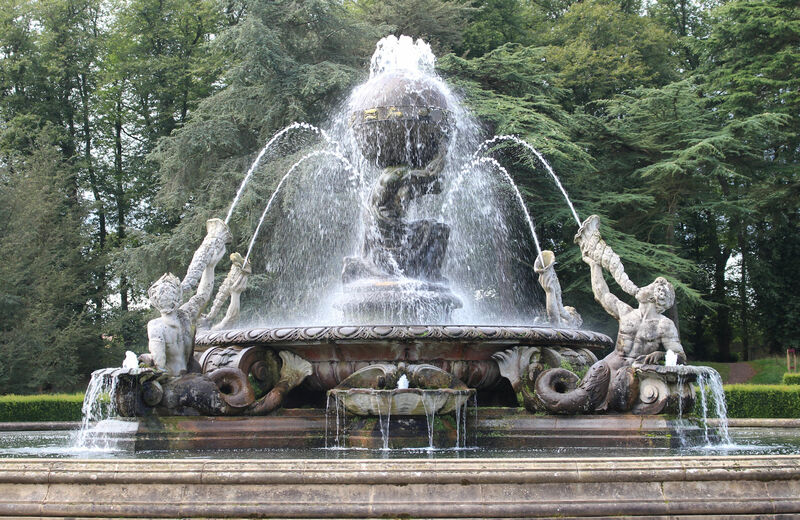 It is intriguing to note that Clare and Doris Vyner were great friends of the then Duke and Duchess of York and had history turned out differently Fountains Hall may have become a royal country retreat. Instead the abdication of Edward VIII set the couple on a different course. 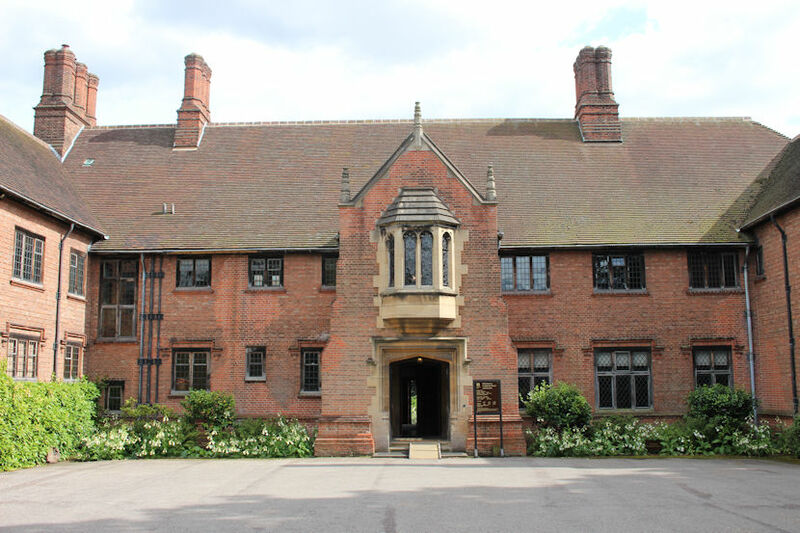 I gather there are plans to open up and make more of the hall, including the re-opening of the chapel room. I hope this comes to pass as this house deserves to be appreciated for the architectural marvel it is. 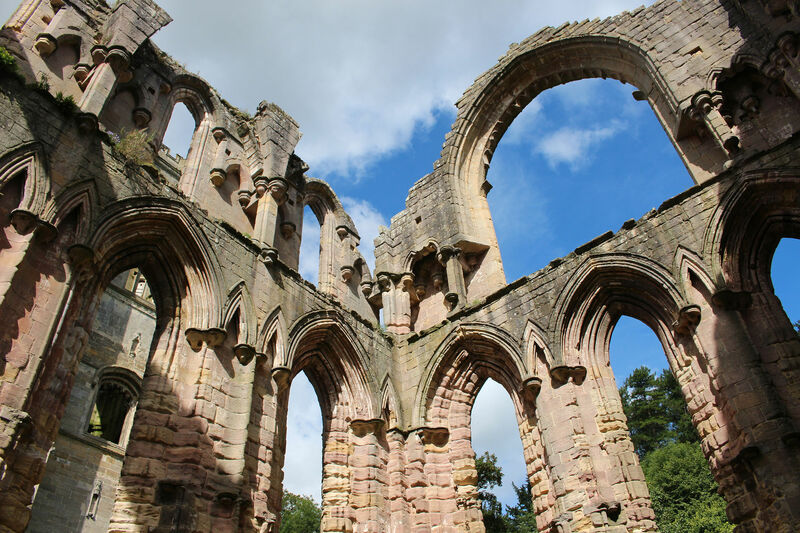 A short walk from the hall brought us to the west range of Fountains Abbey, which was first established on the site in December 1132. 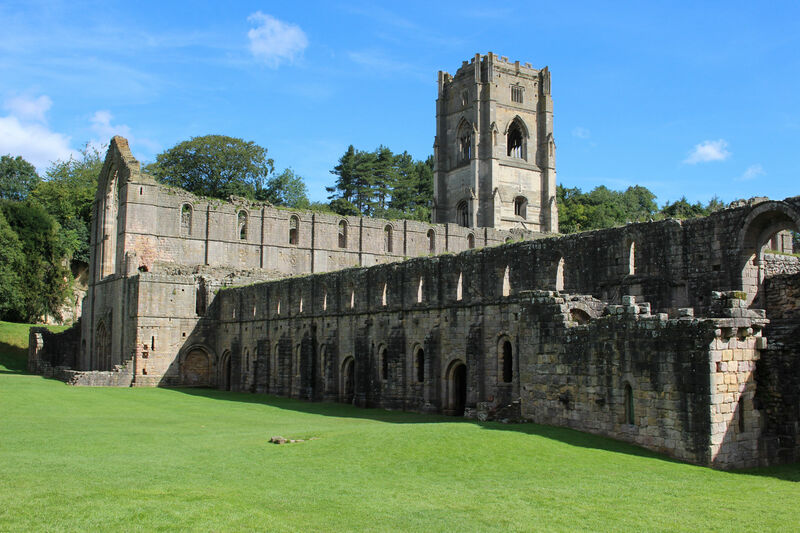 The views of the surviving buildings as you wander through are magnificent and make it pretty clear that this was an impressive complex by the time of its surrender in November 1539. 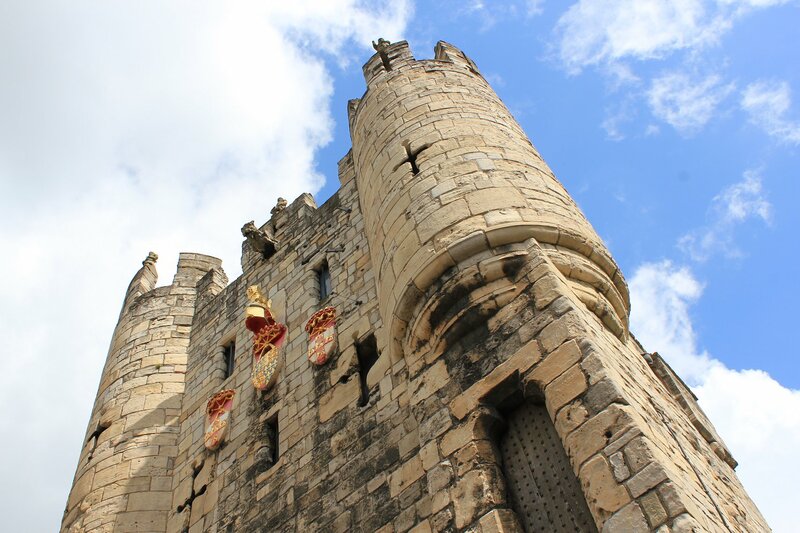 Some elements, such as Huby’s Tower, were barely 40 years old by this point. 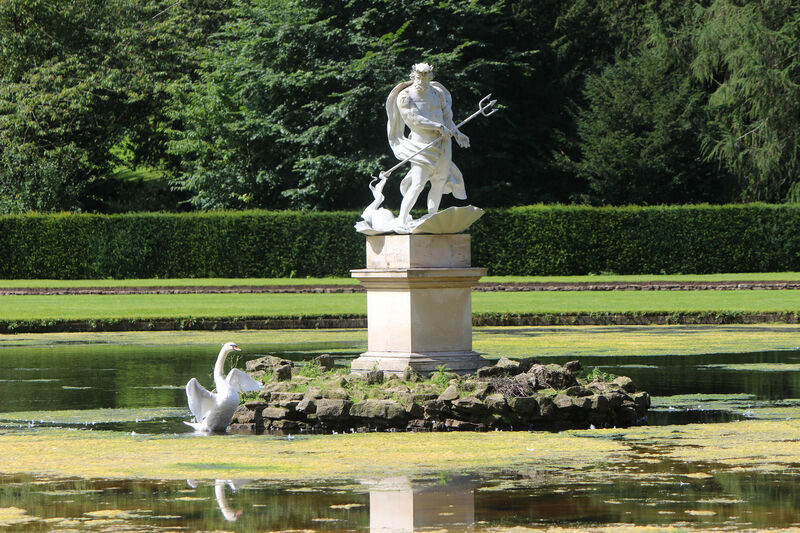 The pleasure gardens present an altogether different collection of delights with temples, towers and statues within a watery setting. 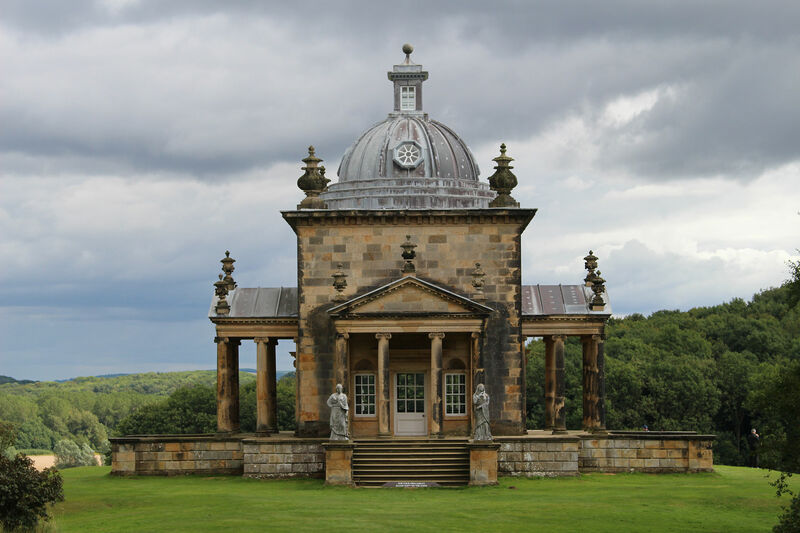 Although these stand on their own today they were originally the grounds of Studley Royal House which burnt down in 1946. 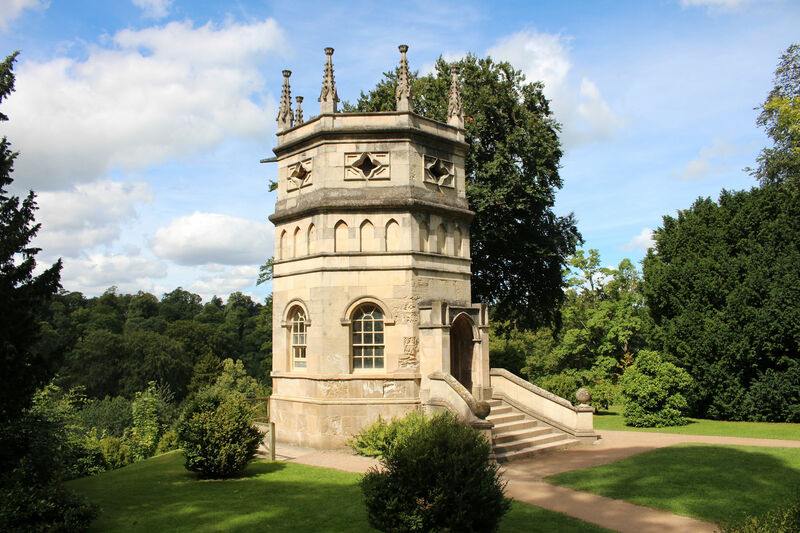 I particularly liked the gothic Octagon Tower which you reach by taking an artificial uphill tunnel (known as the Serpentine Tunnel). 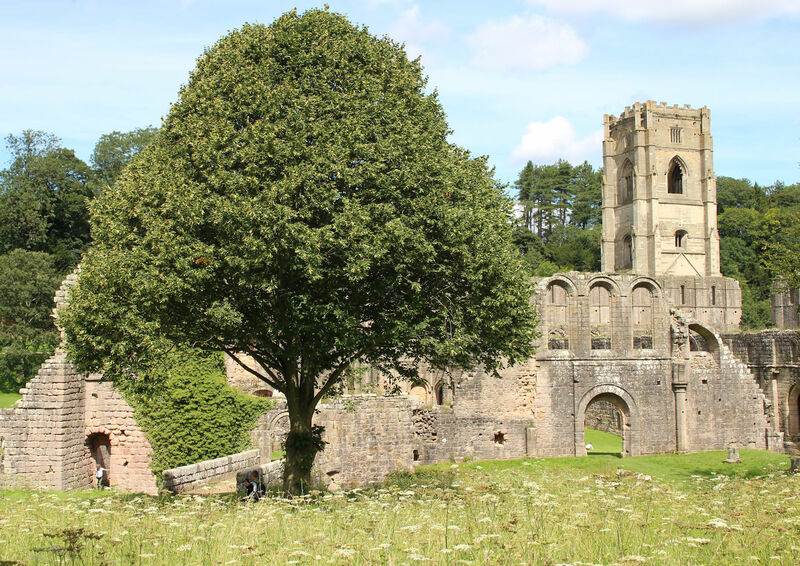 Our day visiting the estate was a delight and it is wonderful to see a site where so many layers of history are so accessible, from the earliest abbey buildings to the carefully engineered water gardens of the eighteenth century and on to the second world war memorial established by the Vyner family inside Fountains Hall in memory of their two eldest children. It is well worth a day of exploration and discovery! 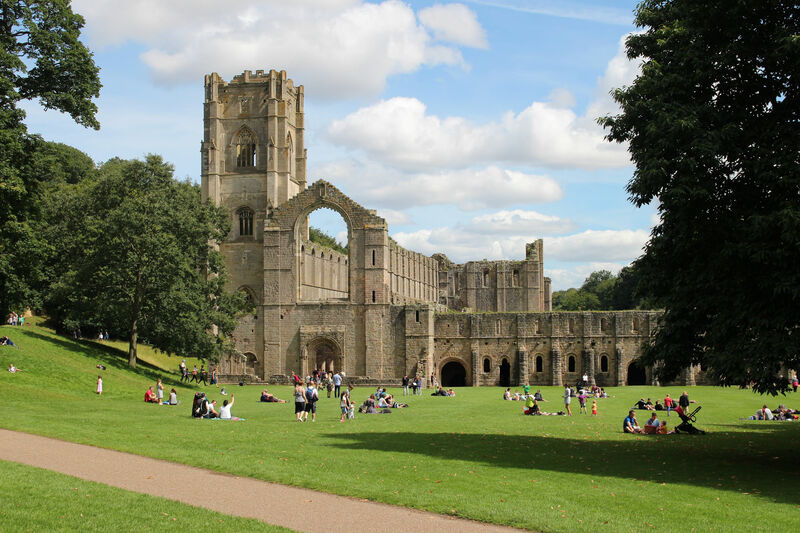 We caught the first 822 ‘Fountains Flyer’ bus of the day from the stop at York Theatre Royal to Fountains Abbey at a cost of £10 for an adult return. 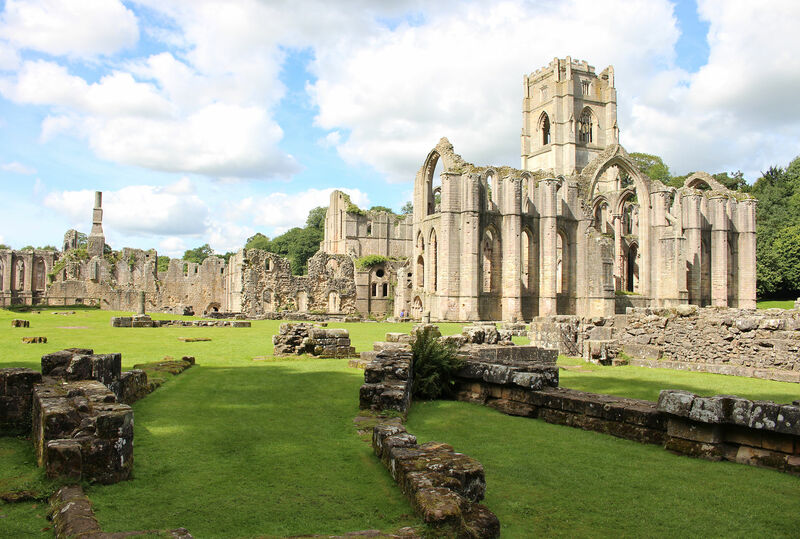 This bus only runs on Summer Sundays and Bank Holidays, taking 1 hour 20 minutes to reach Fountains Abbey via Ripon. The seating on the bus was filled up by the time we reached the halfway point, though many switched to another bus at Ripon. We picked up the return bus at 2pm, but there is a later bus at 4.55pm and I suspect that most of the passengers we encountered in the morning opted for the latter. 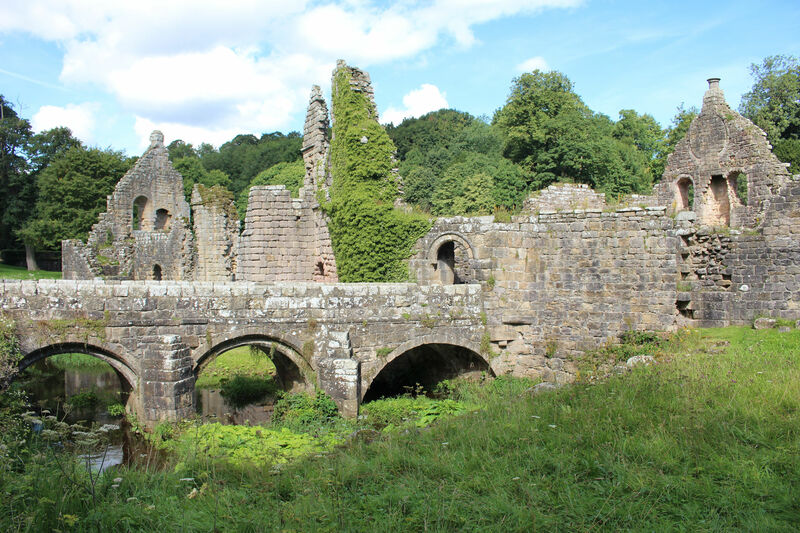 Our stay was sufficient to take in the abbey, water gardens and the hall but we skipped the mill and the exhibition in the Porters Lodge. We also didn’t stray far beyond the National Trust grounds. If you want to take the time to walk out to the Deer Park and St Mary’s Church you would probably need the later bus. 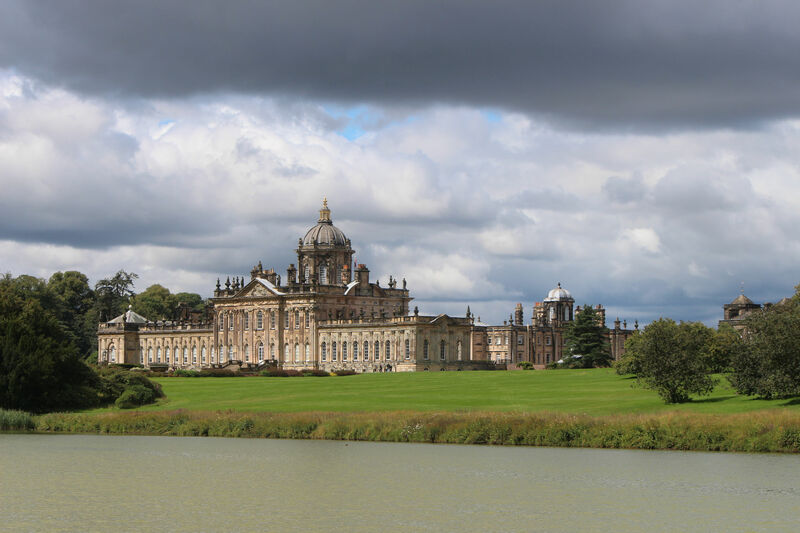 A short stay in Yorkshire gave us the opportunity to spend our Saturday visiting two very different historic sites – Castle Howard and the Treasurer’s House – each with their own fascinating preservation stories. 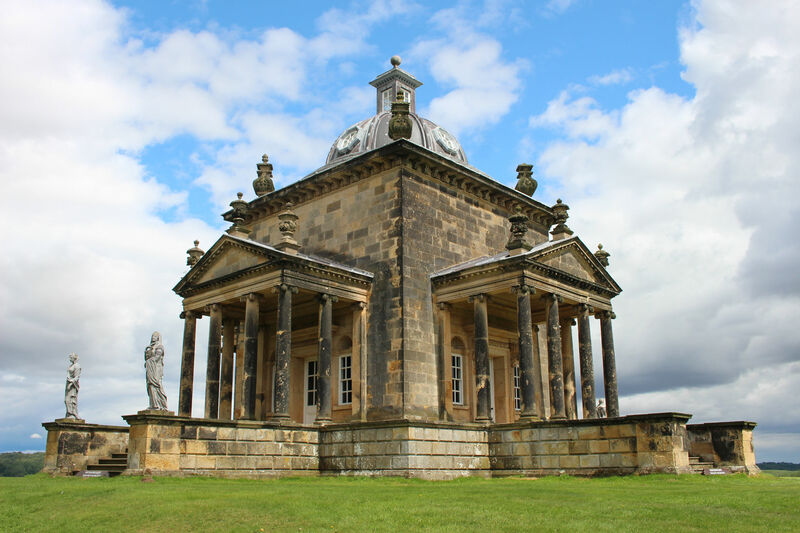 The three hundred year old Castle Howard is a remarkable survivor. In November 1940 the house was ravaged by a terrible fire that destroyed 20 of the finest rooms, its iconic dome and many of its artistic treasures. A third of the building was left open to the skies. 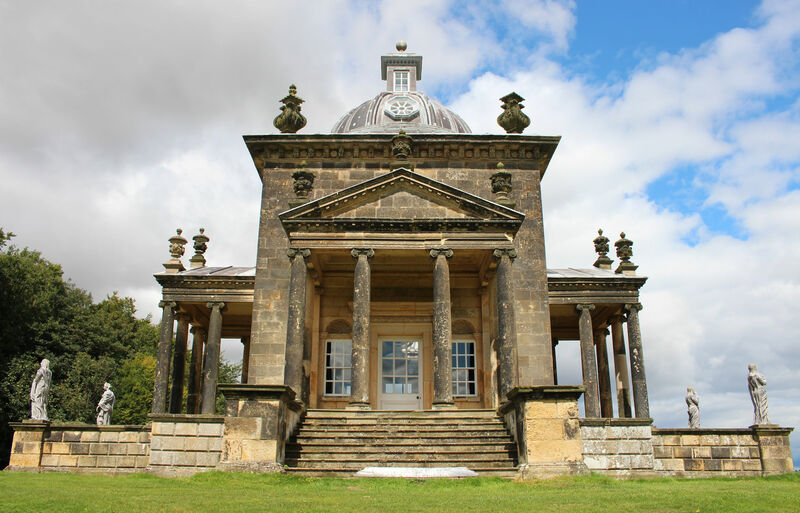 It could easily have started the building on a spiral of decline but instead the family opened the house to the public and set course on a steady programme of restoration that has allowed this stately home to reclaim its place among the treasure houses of England. 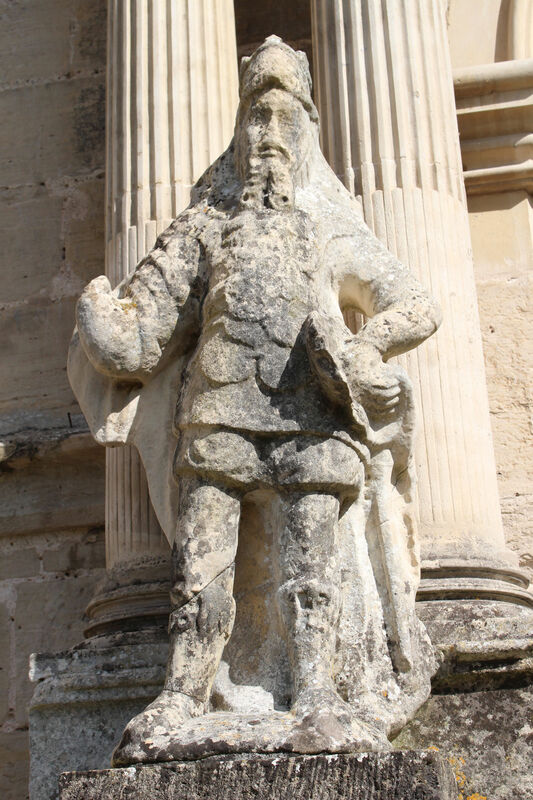 Early successes included the restoration of the Temple of the Four Winds in 1955, the reconstruction of the dome in 1961 and the recreation of Pellegrini’s Fall of Phaeton on the underside of the dome in 1962. The list of works needed to keep this place in good shape must be daunting, including many elements far from the house that many visitors will have missed such as the Monument to the 7th Earl of Carlisle and the castellated walls half-way up the stray (we only half-glimpsed these from the bus taking us back to York). One of the most intriguing elements of the house today are the derelict interiors left over from the fire of the 1940s. 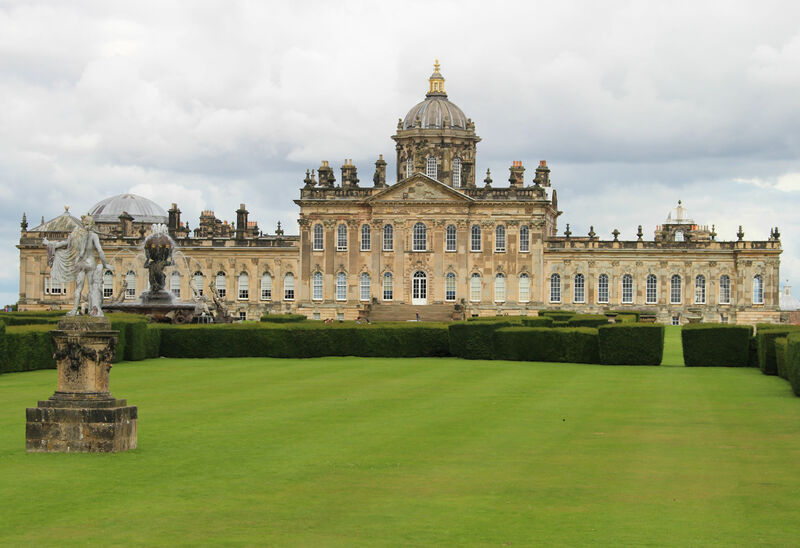 The film company shooting the most recent Brideshead film saw an opportunity to create film sets in these spaces to ‘restore’ the garden hall and the high saloon. The guides in the rooms were keen to stress that everything was not as it seemed the moment we stepped inside, pointing out the most illusory elements and techniques used to achieve the effect of aging. It was certainly effective and gave us a stronger sense of what has been lost here. 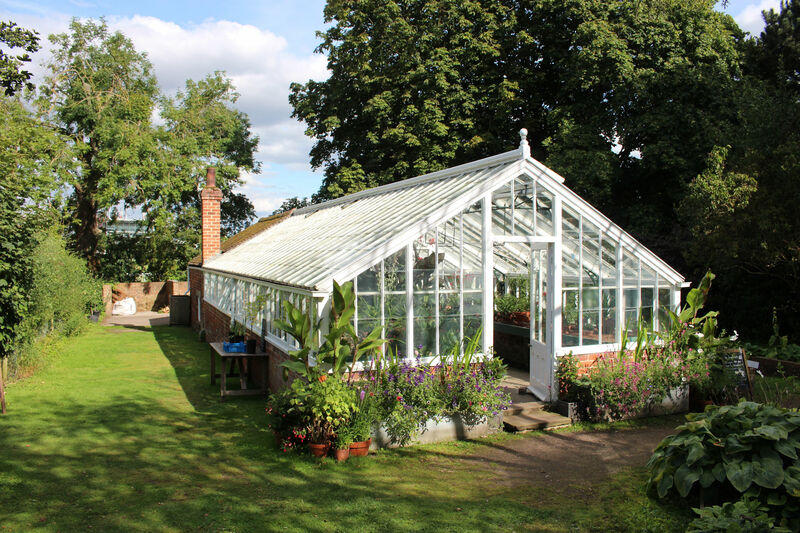 The continuing appeal of the restored house and grounds can be judged in the massive increase in visitor numbers over the past decade or so, with 270,680 visitors in 2016, up from 171,601 in 2004 (according to the figures published by Association of Leading Visitor Attractions). Let’s hope this stays on its upward track, helping to contribute to the funds needed to keep up the ongoing restoration of the estate. 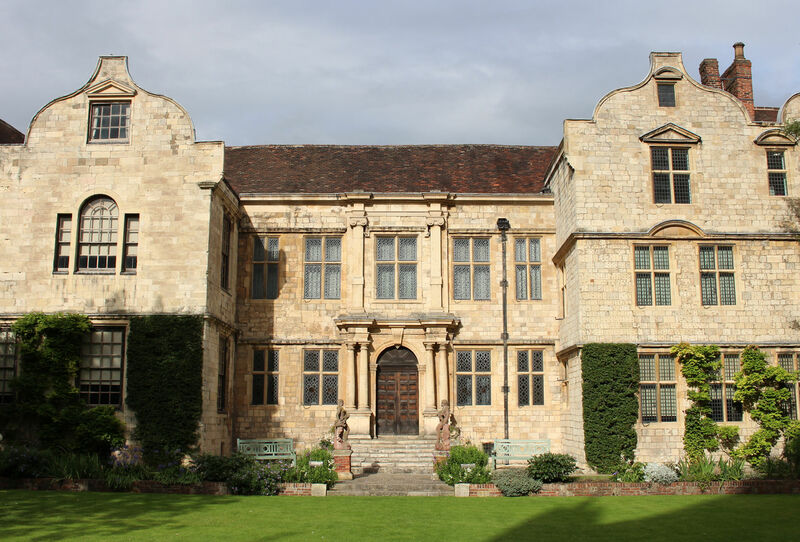 Our second stop, on our return to York, was the Treasurer’s House. 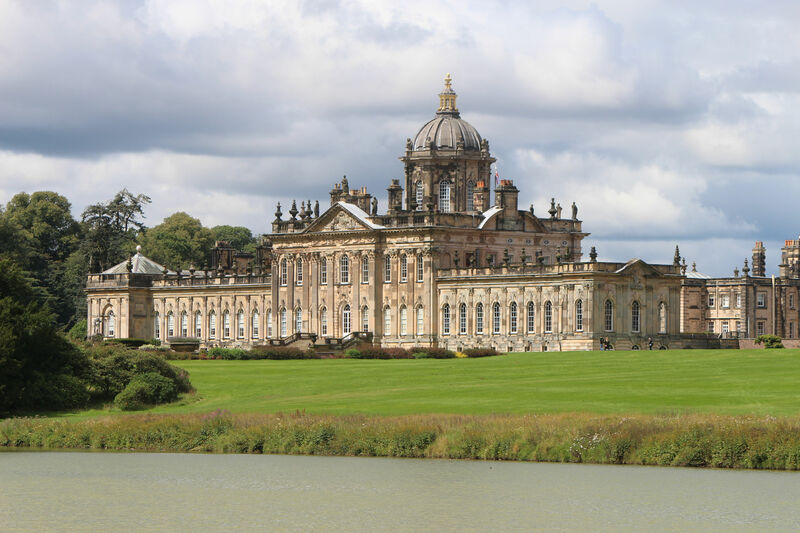 This building has the distinction of being the first property gifted to the National Trust, albeit with the stipulation that it should be presented exactly as its owner specified. You might not think this a problem but that owner, wealthy industrialist Frank Green, had an interesting perspective on historical accuracy which saw him conduct substantial architectural re-arrangement and inauthentic decoration to achieve his vision of how he thought the house must have been. This included the movement of fireplaces, re-positioning walls and the complete removal of one floor! The exacting degree to which this presentation was specified can be seen in the metal studs used to mark out the exact positions of furniture on the floor. 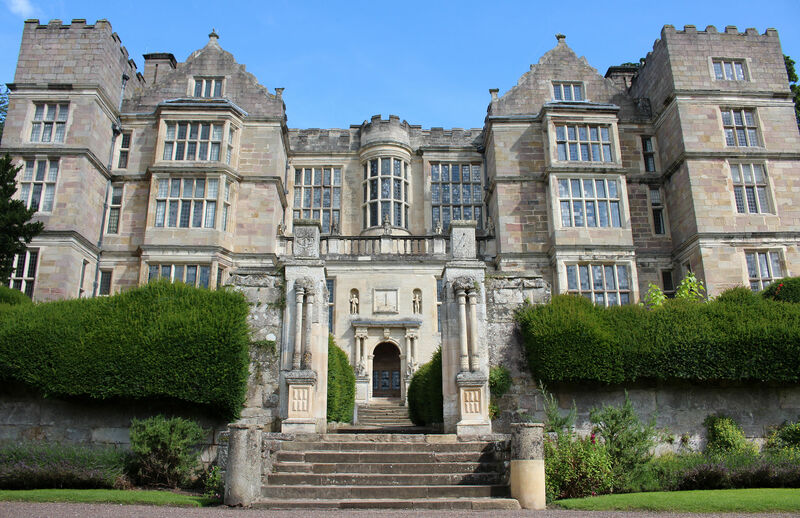 Through the mid-twentieth century the house was presented with more historically accurate interior decoration, but in the late 1990s the National Trust decided that the honourable course of action would be to return the house to the way Frank Green intended it to be seen. In a funny way this makes it all the more fascinating as you enter each room and discover how it had been altered to fit Frank Green’s vision for the house (assisted by the very knowledgeable guides and photographs showing the rooms before and after alteration). 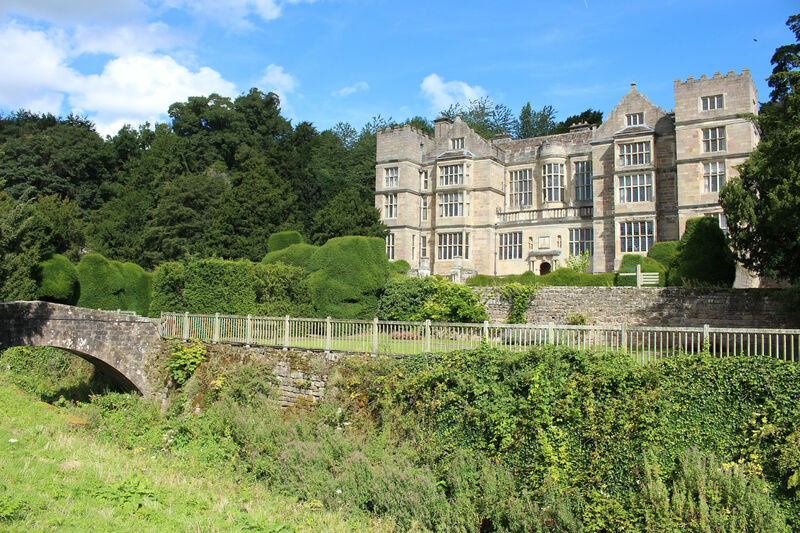 The property has seen more royal visits than you might expect – Edward VII, his wife Alexandra and daughter Victoria stayed here and the rooms given names to permanently record this. However, the rooms were not preserved exactly as they has been arranged for their stay with much grander beds and furniture added afterwards. You can’t take anything at face value in this place! 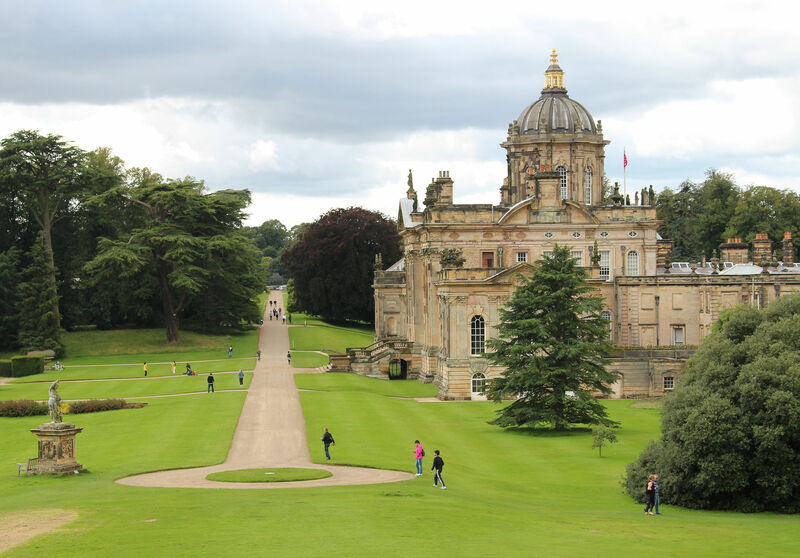 We took the direct 181 bus from York (leaving from stop RM in Station Avenue, a short walk down the road from York Station) to Castle Howard. 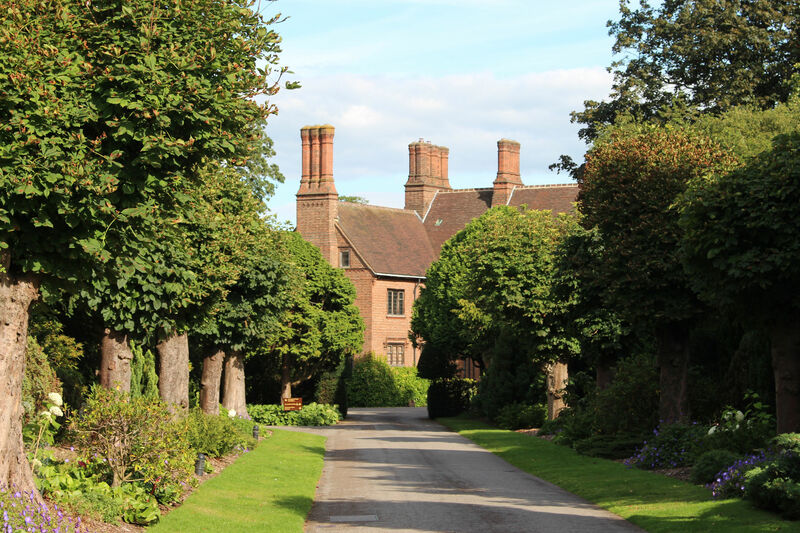 Admission to the house and gardens came to £18.95 (we were able to take advantage of a 2 for 1 voucher from Treasure Houses of England given to us at Hatfield House. The 181 bus route is operated by Stephensons of Easingwold and at the time of our trip a return ticket came to £10 per adult for the hour long journey. It’s only a single decker bus (presumably because it has to pass under a low arch on its way down the ceremonial southern approach, known as ‘The Stray’) but just about everyone got a seat on a busy summer Saturday, suggesting that they’ve got this just about right. Three buses run out and back each day between Monday and Friday, with a fourth added on Saturdays. Separate services are available on Sundays and Bank Holidays between 14th April and 24th September 2017. 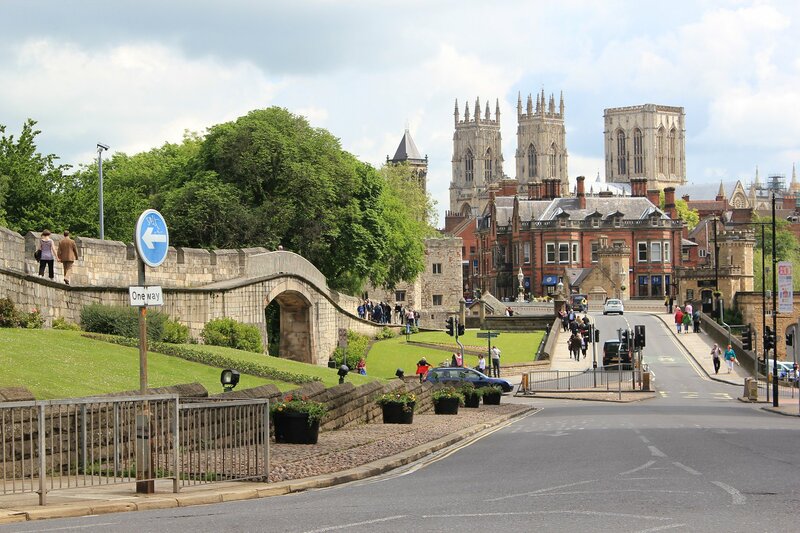 The Treasurer’s House is located in the centre of York, just around the corner from York Minster. 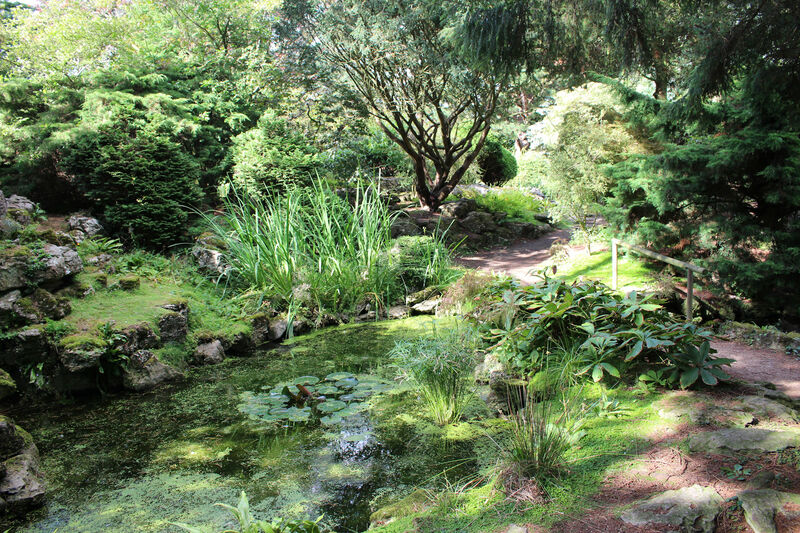 The garden is free to enter whenever the house is open (it’s a lovely space in its own right). 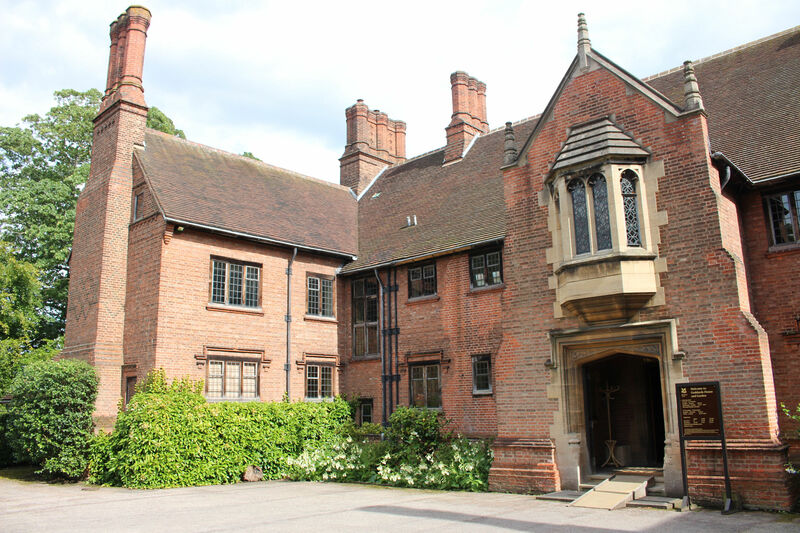 Admission to the house currently costs £8.50 for an adult (including gift aid) but our entry was covered by membership of the National Trust. 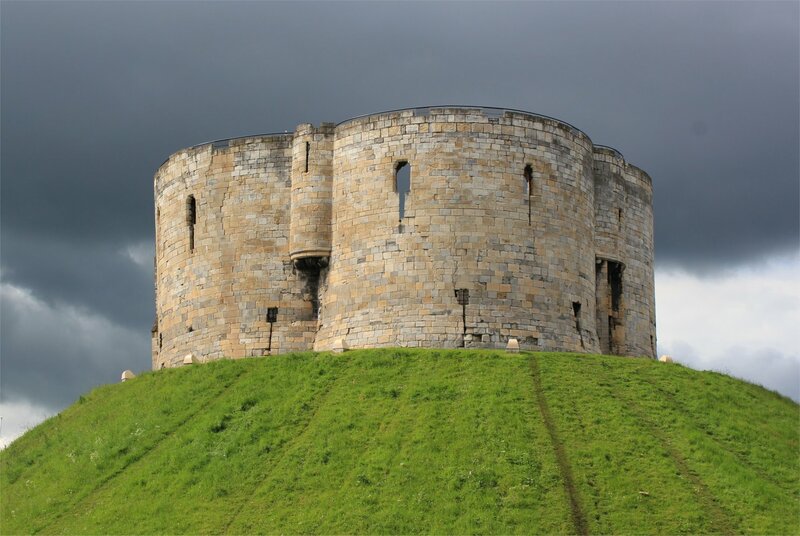 A long weekend in York provided an opportunity to revisit many places that I haven’t seen since childhood such as Clifford’s Tower and York Castle Museum, as well as doing a traditional walk of the walls. However, the highlight of the weekend was a historic building that I have never been to before – York Cold War Bunker. 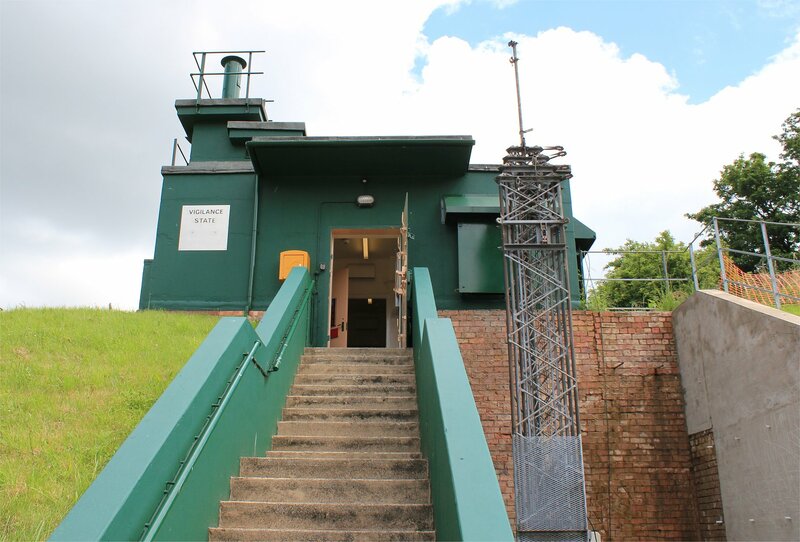 The cold war bunker in York was constructed as the headquarters of the Royal Observer Corps No. 20 group in 1961 and remained in use until 1991. 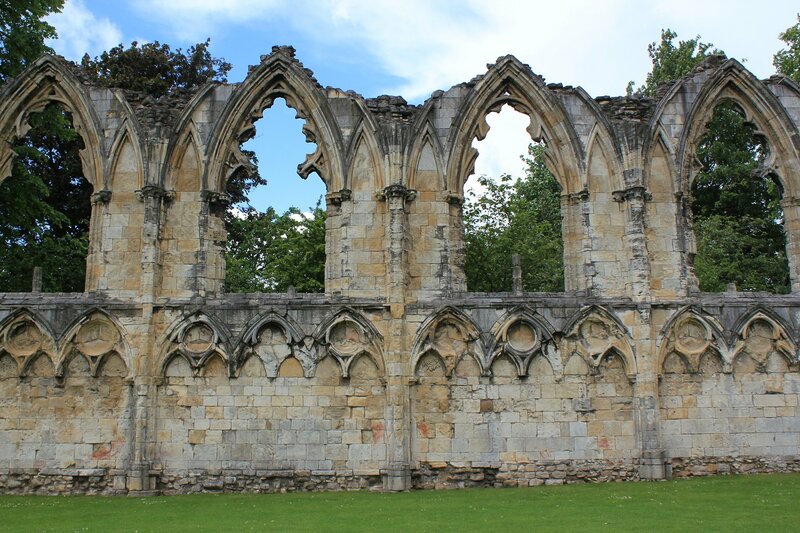 The complex was taken over by English Heritage in 2000 and opened to the public in 2006. Unlike many historic sights which scream their presence to you from miles away this one is tucked away behind a block of flats, hidden from view until the last minute. 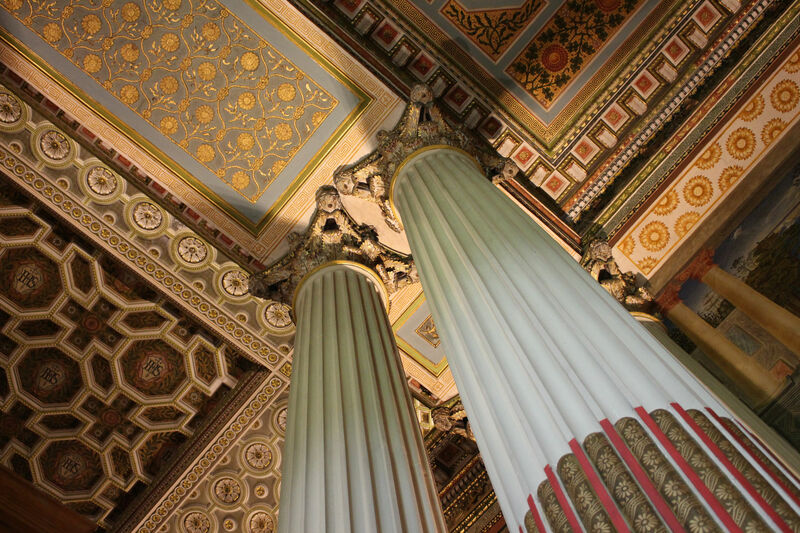 It is only open on Sundays and tours take approximately one hour but they really are fascinating from start to finish. In the event of a nuclear strike on the UK the sirens would have been the signal for ROC volunteers to make their way to the bunker where they would have co-ordinated the collection of data from across the region – on both the strike and its effects. The bunker had a capacity of 60 but there were 120 volunteers, so in the nightmare scenario only the first to reach the bunker would have been allowed in. It would have been a tough call to answer – leaving your family behind and your emotions at the front door (it was forbidden to bring personal photographs with you). A few years ago I visited a nuclear shelter in Berlin which featured a series of airlocks at the entry point so I assumed there would be something similar here, but no – it seemed much more rudimentary, and more to the point, the doors here would have been opened again just 12 hours after the strike (to allow someone to dash out to change the photo-sensitive paper in the recording machines at the top of the building). The operations room sits at the heart of the complex and gives you a sense of the serious nature of the work that would have taken place here, with a map of the region in readiness to plot any pattern to the strikes and the movement of the fallout. Our enthusiastic guide gave us a lesson in plotting nuclear explosions using the equipment to hand and explained the process of sharing this information across the room and beyond. Absolutely fascinating and yet disturbing at the same time. The commandant’s office, opposite the operations room, was the next stop on our tour and contained a wall mounted safe with a sealed letter containing written instructions to be opened only in the event of complete communications failure. The very British nature of the anticipated apocalypse came into play here as the safe also contained the key to the stationery cupboard… clearly the humble pencil and eraser would have been much fought over possessions in the post-apocalyptic world! It is easy to smile at some of the absurdities of the bunker now, but the threat seemed much more real when I was growing up in the late 1970s/early 1980s. It really is fantastic that this site has been preserved and is around to demonstrate to future generations just how mad the world might have become.